Canadian officials reject U.S. citizen Kyle Canty’s refugee application, which says he fears that American police will kill him because he’s black. Kyle Canty will have to pack his bags and return to the United States after Canadian officials rejected his asylum application, CBC News reports. 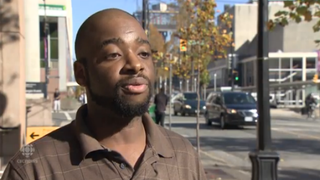 The African-American citizen entered Canada back in September. He told border officials in Vancouver that he was coming for a visit but later filed for refugee status. The New York native submitted video evidence of his interaction with police, which included an arrest for trespassing at an Oregon bus station where he was using free Wi-Fi for two hours. Canty, 30, also admitted to several other minor charges, such as jaywalking and disorderly conduct. The refugee board reportedly acknowledged that the police in the United States disproportionately stop and question African Americans. But it emphasized that refugee status addresses persecution—not harassment. “I find that the claimant is not a Convention refugee in that he does not have a well-founded fear of persecution for a Convention ground in the United States of America,” the refugee board’s Ron Yamauchi wrote in the decision. Prior to the board’s decision, Canty said he would appeal an unfavorable ruling. Read more at CBC News.